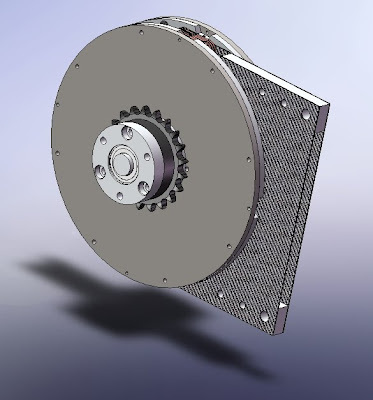 Okay, I've been playing with SolidWorks a little too much. 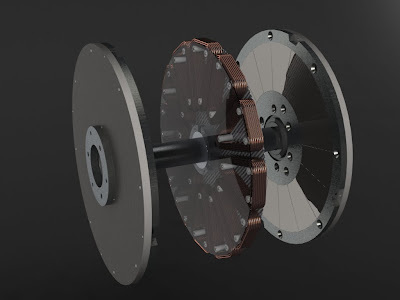 Here's the thought: Since I already have awesome rotors with conical bearings for my axial flux motor, maybe I can get something up and running quickly while I debate what to do about the problems with the full ("epic") version. 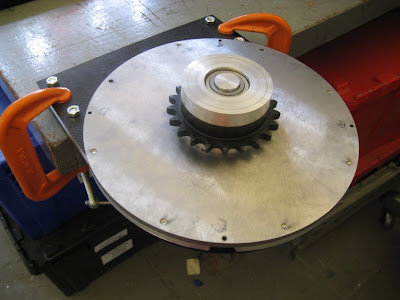 Specifically, the cost in both dollars and hours of finishing the stator, the difficulty of assembly and testing, and the lack of a real use for it anymore are limiting my desire to push hard on the segmented stator core version, thus far the focus of the project. 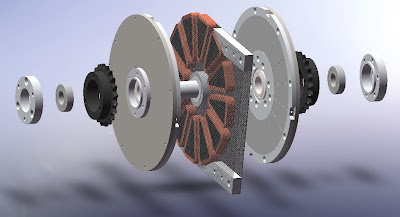 Talking to some solar car types got me thinking about coreless motors. A coreless motor is a motor that has no steel core, just windings. In fact, for the first time this year M.E. sophomores at MIT got to make coreless DC motors as part of Mechanical Engineering Tools. They have some obvious benefits, such as lighter weight, no cogging torque, and high efficiency due to the elimination of core losses. 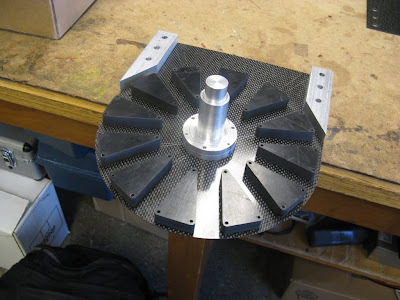 Rotor: Same as before. These magnets on two low carbon steel backings. Not ideal for a coreless motor, but they already exist which gives them +1,000 points by my score keeping. Stator: 14AWG magnet wire, 28 turns per coil, 12 coils in the following winding pattern: ABCABCABCABC. For once, I'm not using a crazy fractional-slot configuration because cogging doesn't matter. As a reference value, I am using 20A as a reasonable amount of current to put through this wire, which equates to about 10A/mm^2, or 200 circular mil per amp. This is not conservative, but not insane. Gap: The gap between magnets is 0.7". This means the peak flux density is about 0.5T, with these magnets. This is significantly lower than the 1T field density in the air gap of the steel-core motor. 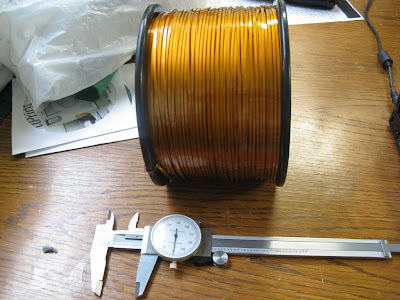 This, plus the fact that 0.7" is not a whole lot of space for copper, is what will make this motor less powerful. So, what about those four methods? The force acting on the wire is just: F=IBL (fibble), and it obeys the right-hand rule. In a motor, there are many lengths of wire all carrying current, so we multiply in the total number of active wires, N. Also, to get to torque, we use a radius, R. That gives T=NIBLR (nibbler). In this motor, N=448, I=24.5A, B=0.5T, L=2in, and R=3in. (All roughly speaking...I can justify those numbers but it would take another page of maths.) This gives a torque of 21.2Nm (at this value for current, which gives the same power dissipation as 20A continuous in each wire...don't ask). The trick I've been using for axial motors in FEMM is to unwrap them around the average radii of action. So, the magnets span from 2in to 4in. I unwrap the motor at the 3in radii, literally unrolling it into a straight line. This has worked pretty well for me so far, but it's a little trickier with a coreless motor, I think. Anyway, FEMM allows you to set material properties, magnet orientation, turn counts, current, etc. It then can predict electromagnetic forces. It is inherently a statics program, meaning it will give you a force, but won't simulate motion or back EMFs without some coding (see below). Anyway, all I really care about for now is a ballpark torque estimate. So, I put the model into FEMM and put 24.5A into a coil sitting right between two magnets (max torque). It created a force on the coil of 32.6N. If 8 of 12 coils were generating this force, at a 3in center of action, it would create a torque of 19.9Nm. Import geometry. Group coils so that they can be selected as one block. Loop through a set of angular displacements for the coils, moving the block between each one. Run static analysis each time and record flux linked by the circuit. The more points you take, the less noisy it will be. How do you get from back EMF to torque though? Thanks to The Best Motor Reference Ever, I finally understand this link. The idea is simple: Take the back EMF and drive a current into it. That's power. On the other side, you get torque and speed. Speed is already set by the electrical frequency you choose in step 3 above (1,000RPM in the case of this example). So just...solve for torque. This all works very nicely when you assume that both the back EMF and the current driven are sinusoidal. You can then use RMS values to get power. 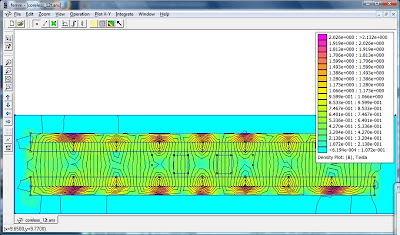 Doing this quick math for the FEMM dynamic back EMF nets a torque of 18.4Nm for 20A RMS. 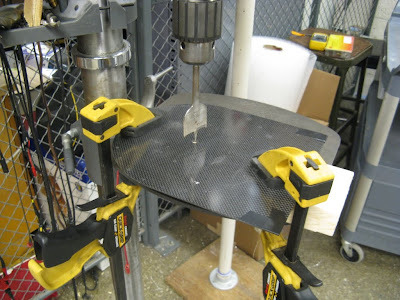 Method #4: What the FluxCutter? Ok this isn't a real method. I just made it up. 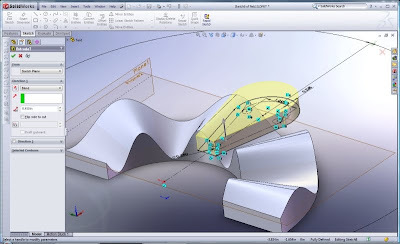 But it might have some appeal to the mechanically-inclined out there, since it's a very geometric method involving CAD. The problem I was trying to solve was: FEMM is 2D. It can't account for the strange shape of the coil, which occupies a different fraction of the circle at the inner radius than it does at the outer radius. How, then, to get a fourth method (there must be four, now that I said it) without switching to a 3D magnetics package? 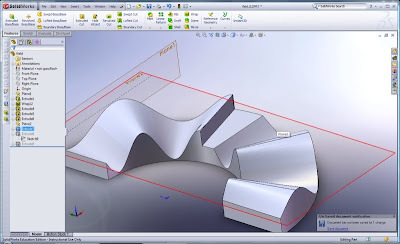 Well, I can use a 3D CAD package...like SolidWorks. First, I made a visual representation of the flux density one might see in this motor. I made it sinusoidal, but really I guess you could make it whatever you want. FEMM suggests it might be sinusoidal in the middle, and closer to trapezoidal near the magnet faces. Anyway, a sinusoid seems like a decent place to start. I wrapped that around a cylinder with the correct inner and outer radius, in inches. Then, I scaled the z-axis features such that 1 inch was equal to 1 T. Thus, 1in^3 is really 1Tin^2 which can be converted to flux in Webers! All that's left was to make the FluxCutter, an extruded cut with the profile of an individual turn of wire, that cuts volume off the bulk shape. By measuring this change in volume, I got the flux. The rest was the same as Method #3. Oh, except I could also account for the slight offset as coils get wrapped in multiple layers. I assume FEMM does this for spread-out coils, but not in 3D. With a chunk of flux cut out. I will admit this is just plain silliness. You get more accuracy in the shape of the coils, but less accuracy in the shape of the field. (Unless you can model the 3D field more accurately than a sine wave...which if you can do that you probably already have a 3D magnetics simulator.) But it was fun and did yield a result. 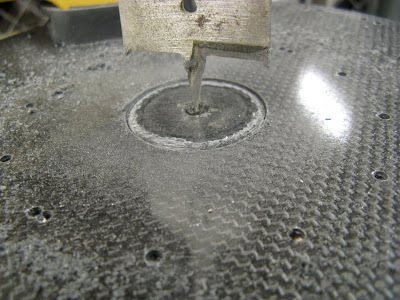 The torque predicted by this method was 15.8Nm at 20A RMS. In summary, the four methods I use predicted reasonable torque values between 15.8Nm and 21.2Nm for 20A through 14AWG wire. I would call that pretty consistent. 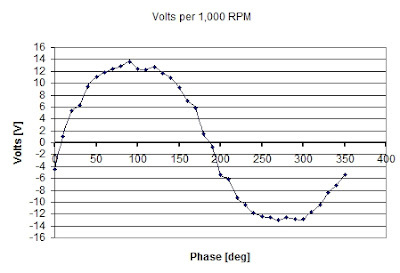 This says nothing about the operating voltage and current of the motor; that would depend on whether the coils are connected in series or parallel. (Probably, all four would be in parallel, giving an 80A motor...but the torque is the same.) Depending on the achievable speed, this is decent power (1.7-2.2kW per 1,000RPM). And this is not really a peak rating. What about dissipation? Well, a quick estimate of the resistance of such a winding suggests that at 20A the motor would be dissipating a bit under 200W due to copper losses. So it has a chance to break into the mid-90% efficiency range by 2,000RPM, and even earlier at lower currents. 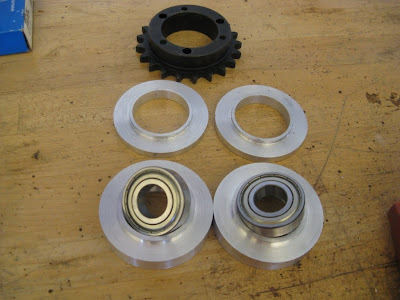 Although I think with the existing bearings it won't. So, not quite as epic as the full version, but probably worth a try. 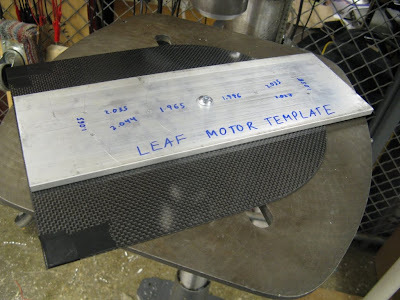 It's definitely easier to make, and might in fact make a very practical motor.